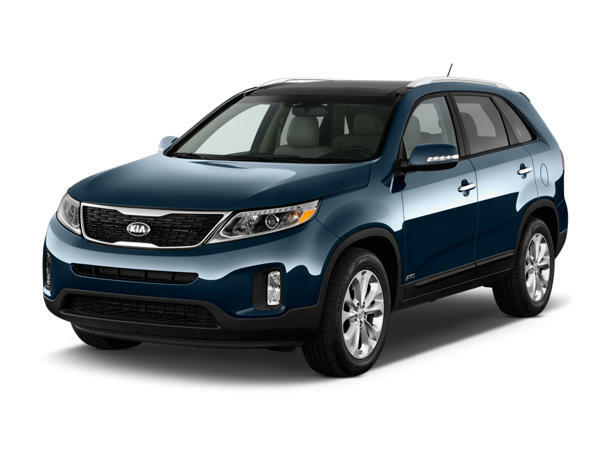 KIA has raised the bar with its revamped 2014 Sorento crossover, making it a much more enjoyable drive than the 2012 model I tested roughly 18 months ago. This is the smaller cousin of last week’s Hyundai Santa Fe, which wins on value and size, but Sorento wins on handling and performance, while packing the same engine and transmission. For the record, the new Sorento looks much like its predecessor, which means it’s attractive, I think more than Santa Fe. But the wheelbase also is 4 inches shorter and overall it’s 9 inches shorter in length. That makes it look, and feel, a bit sportier. It’s also 200 lbs. lighter, and that improves its power to weight ratio, which you feel at every stoplight. Where the Santa Fe felt heavy and somewhat lumbered away from a stop, the Sorento seems livelier. Both feature Hyundai’s new 3.3-liter, DI V6 that packs 290 horsepower. This is a new engine replacing the KIA 3.5-liter V6 that made 276 horses. The new V6 comes in all trims except the entry level LX which features a DI I4 that creates 191 horses. Fuel efficiency dips a bit, according to EPA ratings. But remember KIA got into a bit of trouble with the EPA for using more optimistic numbers than it should have on previous models. I was happy with 23.7 mpg in about 70% highway driving, but I must say the trip computer was about 2 mpg more optimistic. I’m seeing a pattern here. The EPA rates this model at 18 mpg city and 24 highway, running on regular gas. Note too there is an ECO mode button you can press to suppress acceleration and reduce gas consumption. I was driving a bright “snow white pearl” SX Limited, the top-level Sorento, with an eye-popping starting price of $39,700, not exactly what you’re used to seeing on KIA products. Still, it does ride much better than the previous model and was Loaded with electronic goodies. KIA stiffened the chassis’ torsional rigidity by 18%. So what? Well, that results in a better ride. By firming the chassis, the engineers can much more easily control ride quality. So the Sorento’s MacPherson struts with coil springs and a stabilizer bar up front and a multi-link system in back, also with a stabilizer bar, do a better job with bump control than the previous suspension, of similar design. Sorento offers plenty of cargo room behind the second row seats for family trips, but if you opt for a third row seat, there is basically just room for grocery bags. Its steering is handled via a hydraulic power assist system on a rack and pinion setup, and also offers three modes, like the Santa Fe. So you choose from Sport, Normal and Comfort, with Sport delivering the most pleasant and responsive steering wheel feel. While this is all similar to Santa Fe, the Sorento’s steering feel is lighter. Selecting Normal or Comfort lightens it more and makes the crossover more prone to a vague feel that requires some correcting at higher speeds.Braking is good from four-wheel discs, vented in front, and shifting is smooth from the 6-speed automatic that features Shiftronic, allowing the driver to manually shift, without a clutch, if desired. This model comes with AWD and stability control too and with 7.3 inches of ground clearance you Could take it off-road some. Boat and camper haulers will be glad to know it’s rated to tow 3,500 lbs. too. Inside, I found the Sorento more attractive and comfortable than the Santa Fe, at least from a driver’s standpoint. This one had a black leather interior with white stitching on the seats and doors, with matte silver trim around the gauge faces and center stack controls. There’s a fake black wood trim on the dash and doors too, along with the top of the steering wheel and console. Like the Santa Fe, this is quiet inside, and with this gussied up edition you get a power rear hatch. Note to consumers, there is a power button by the overhead lights. If someone happens to turn that off, the hatch won’t work – took me a while to figure that out. What you won’t get inside the Sorento is quite as much second and third row seat room as in the longer, almost minivan-like Santa Fe. Foot and knee space was more limited here in both rear seats, making it a little difficult to turn and extract your feet from the second row easily. The third row is simply for small children. That seat is a $1,000 option, which also includes third row seat air conditioning controls. Cargo space is also more limited. 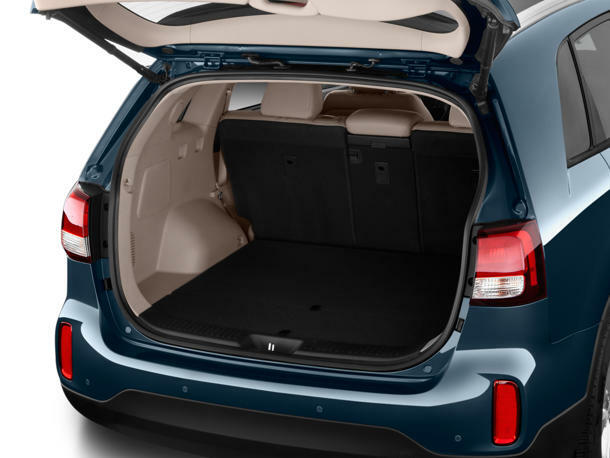 Where the Santa Fe had 13 cubic feet of cargo room behind he third row seat, the Sorento has 9.1 cu.ft., about enough for 4 bags of groceries set width-wise behind the seats. Those seats fold nice and flat though and are easy to pull back up with the tug of a strap. Seats are comfortable, with mostly flat cushions and slight back cushion contouring. Both front and second row seats are heated, and the front seats also are ventilated for cooling in summer. A heated steering wheel also is standard on the Limited model. 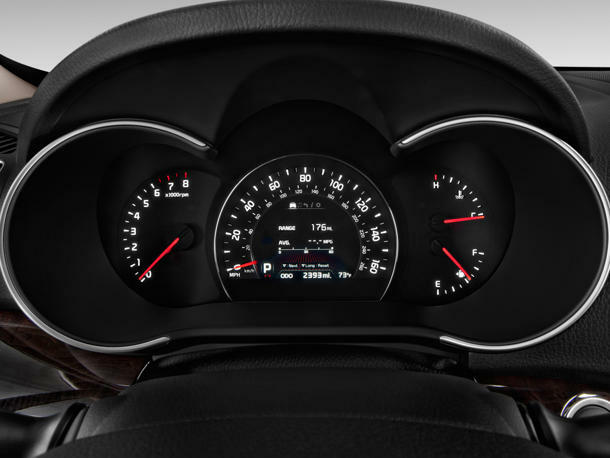 Sorento’s gauge pod is attractive and easy to see. 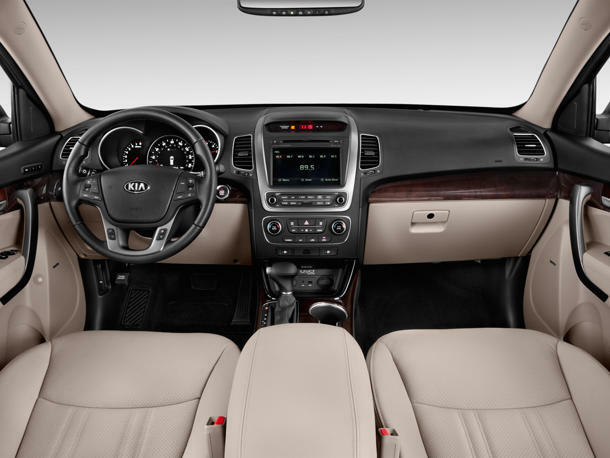 Other safety related goodies on this model include a rearview camera and blind-spot warning system that beeps when you flip on the turn signal and there’s a car or other obstacle in your blind spot.Sorento’s dash is well laid out too, with easy to see and find gauges and buttons. Everything makes sense and the steering wheel is a manual tilt/telescope number, with radio, trip computer and phone control buttons on the hub. Overhead is a giant panoramic sunroof. One concern there is that you cannot retract just the internal cover all the way to the rear. For that to retract you must open the front portion of the glass sunroof, and then the inner cover will continue opening to its full-open position. The rear portion of the roof does not open. One other complaint, the incessant chime every time you get in the vehicle, or turn it off; that’s just annoying. The test crossover is the priciest Sorento, with that $39+ grand starting price, and this one hit $41,600. You can still add a few more options to get to $43 grand and change. But for less affluent buyers, the LX with its I4 engine and 20 mpg city and 26 mpg highway rating starts at $24,100, with front-wheel drive. A V6 powered LX FWD starts at $25,700, if you need the power to haul your crew. There are 10 trims available with either FWD or AWD and all carry KIA’s stellar 10-year/100,000-mile warranty and 24-hour roadside assistance. That certainly adds value. Hits: Good ride and quiet interior. With third row seat will carry 7, if two are small children. Handles well on sport mode (3 modes available) and offers ECO mode to save fuel. Flip-down rear seat is easy to boost cargo room, power hatch and heated/cooled front seats, heated second row seats and heated wheel. Well arranged controls, good seats and big sunroof, plus better acceleration than sister Santa Fe. Misses: Tight foot and legroom in second and third row seats, plus that incessant chime every time you get in or turn off the vehicle is annoying.